I promise to get back to the birth story tomorrow, but I wanted to quickly share some picture from our weekend! We took a short camping trip up in Jim Thorpe, the town that Matt lived in and proposed in three years ago. It was their Fall Foliage Festival, so it was a little more crowded than we would have liked, but it was great to return to our old stomping grounds and take our baby to the places we used to frequent. We even ran into some of Matt's friends, his old students, and his old landlord, all of whom were rather shocked to find out that he now has a child! Jim Thorpe is such a charming little place, it almost doesn't seem real. It is one of those places that has multiple art galleries, musicians playing on the streets, funky paint, and enough emphasis on history to pique your interest without making you feel like you are at a Renaissance Faire. 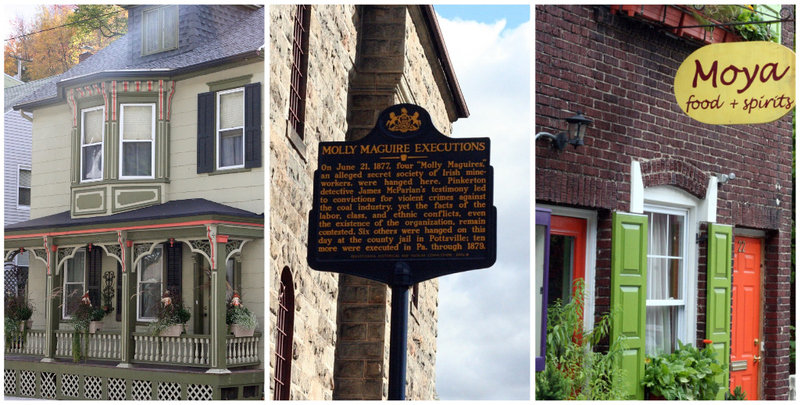 For those who are curious, the sign in the center is detailing the executions of several Molly Maguires. One of those stories in history that totally draws you in and makes you wonder how have I never heard of this before?! Sean Connery sure thought so! We were excited to take Jack to the rocky little creek bank where Matt dropped to one knee and made this whole thing official. Oh Jim Thorpe, how we have missed you. So there you have it, a fun-filled, kinda chilly weekend in the Poconos. In retrospect, the bright orange vest looks a little Life Jacket-ish doesn't it? Glad you guys had a good weekend! The Poconos are my stomping grounds! What a great weekend!! Love the pictures! Looks like a cute place, how fun to be able to bring your baby back to show him around. Wow, looks like a great place... I'll have to plan a visit.